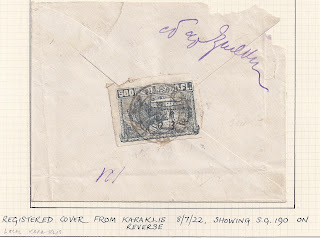 In the 1950s when Tchilingirian and Ashford were working on The Postage Stamps of Armenia they had access to just two main groups of non-philatelic postal history for the 1919 - 1923 period. 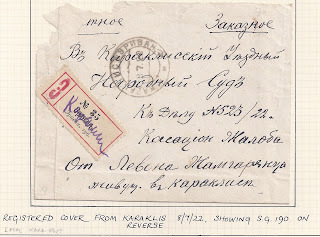 For the Dashnak period, they had examples of mail sent abroad to the Hairenik [sometimes Harenik] Press in Boston, USA This was an important Armenian diaspora publisher - a Google search shows it publishing books and journals until the 1970s. The Ashford collection contained three Hairenik Press items; two were offered as single items and illustrated in the catalogue and the third - shown below - was included in a group Lot and not illustrated. None of these three items has transit or receiver cancellations but it seems likely that they - along with other covers to the same address - travelled and thus became available to collectors in the West. They would have gone first to Batum and then to Constantinople. The British would have been involved for the period during which they occupied Batum [ See Footnote *]. Click on Image to Magnify. For the Soviet period, T&A had access to internal mail from what they call the "Law Courts Hoard". These were covers sent by private individuals to Law Courts not only in Yerevan but other districts. They were franked with adhesives. Many of them are damaged or cut down. At the time these covers were sent, Courts often bound or sewed correspondence into files; they could only be removed by tearing them or cutting them out. 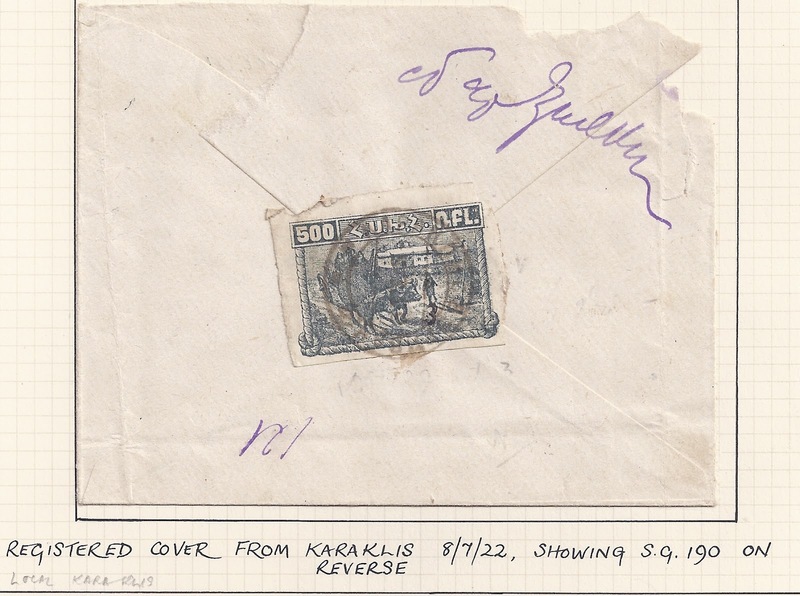 These covers should not be confused with the Soviet Armenia official correspondence of the 1921 - 23 period which came on to the market in the 1990s. 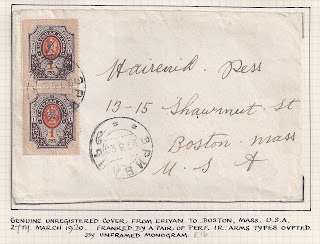 This mail was originally stampless [ Free Frank] but came on to the market only after adhesives had been added and cancelled with fake cancellers - I have written about this in several places, starting back in the 1990s. The Law Courts covers look rather different. 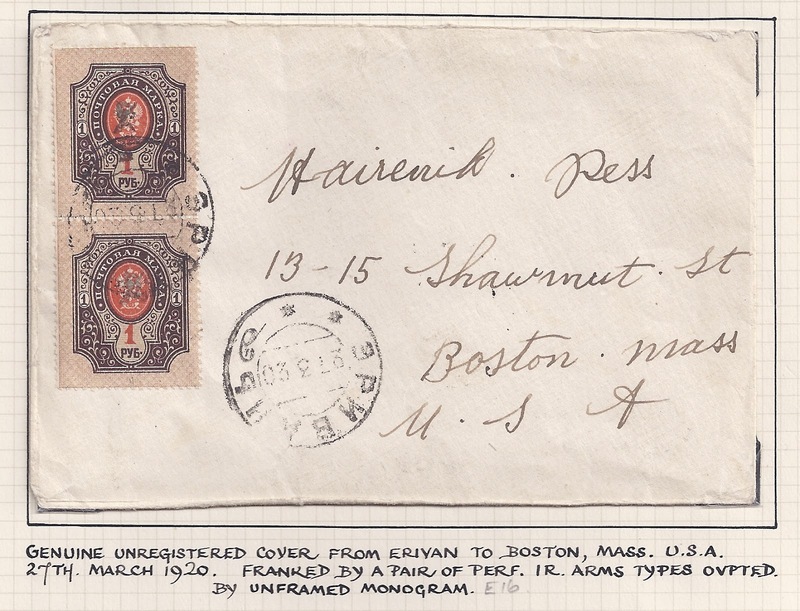 One notable feature is that imperforate stamps have often been separated by tearing by hand or slitting with a knife - indicating that the post offices had no scissors. 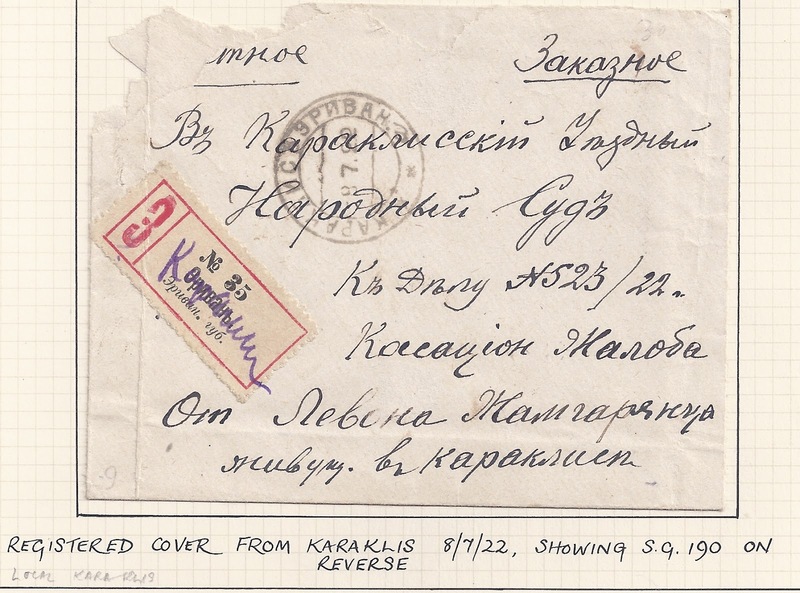 This is illustrated by the cover below, sent locally within Karaklis to the Karaklis People's Court. On the left of the cover you should be able to make out how this cover was originally held in a binder - there is a crease and a pin hole. As an example of a Law Courts cover, it is one that is nearly intact - others are more fragmentary. Unfortunately, the first people to obtain these covers amused themselves by pencilling the covers with catalogue numbers, values and any other random thoughts that occurred to them. These pencilled notes have been rubbed out on the cover ilustrated but can still be seen on these high-quality images. [ Moral: Tell dealers not to scribble on their stock!] Click on Images to Magnify.